Price is the purest form of support and resistance. Despite this, there are other indicators that act as subjective support and resistance. Although they are not real support and resistance, they are so widely followed that when traders see them, they treat it as support or resistance. In the end, it becomes a self fulfilling prophecy. The 200 MA being one of the most followed moving average has a powerful effect on traders. Somehow, stocks mysteriously find support or resistance when they are near the 200 MA. 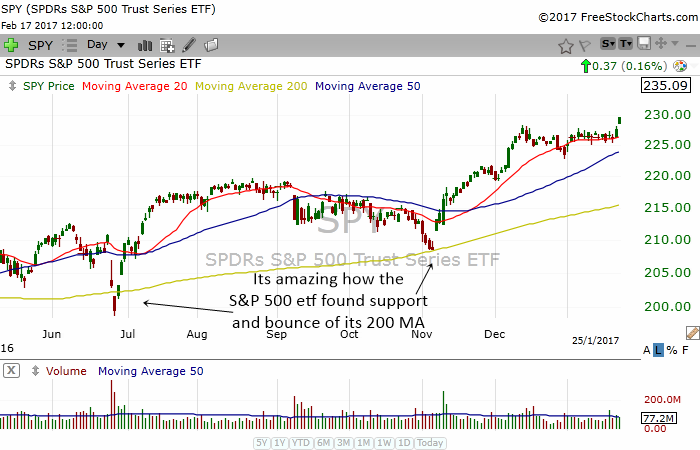 In the chart above, you can see how the 200 MA acted as support for the SPY not only once but twice! Its amazing how the 200 MA can halt a drop. 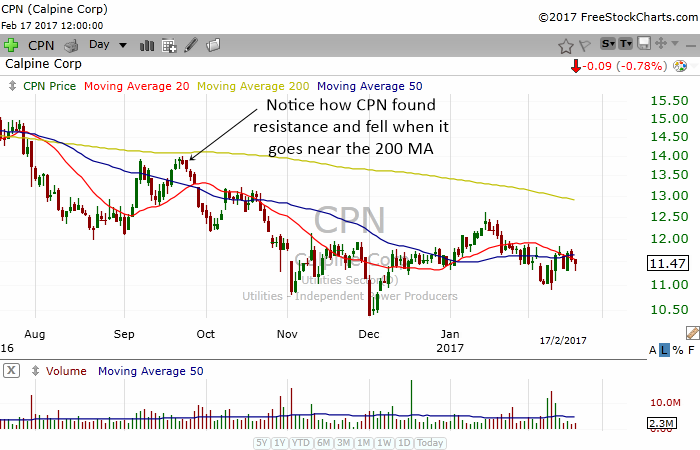 The chart above shows how CPN found it difficult to rise when it is near the 200 MA. The 200 MA acted as a subjective resistance. 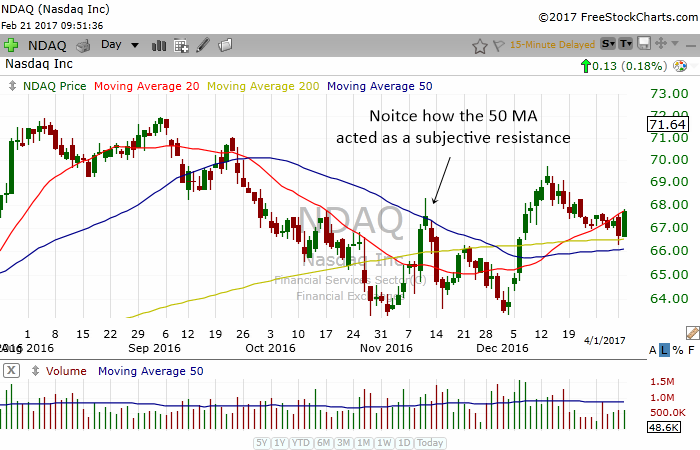 The 50 MA is another very popular moving average that is observed by thousands and thousands of traders. It has the same power like the 200 MA to make stocks reverse direction. When you have 2 major moving averages at the same area, it acts as a very powerful psychological support. 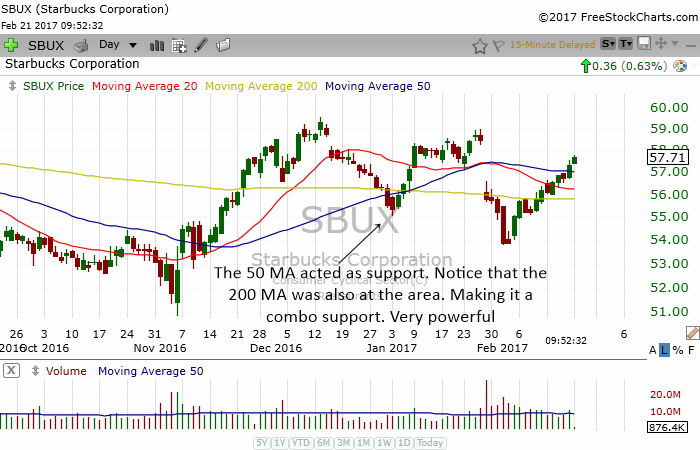 Take a look at the chart above and you will see how SBUX setup a very potent reversal signal in January when it met its 50 MA and 200 MA. In fact, I took this setup for a swing trade. I held it for a few days and sold it. I personally do not like using the Fibonacci as I think its so subjective depending on where and how you draw the line. But I have to confess sometimes I'm amazed at how stocks tend to reverse direction when they hit these percentage retracements. In the chart above, you can see how CCJ found resistance at its 50% Fibonacci retracement area. The stock was unable to move higher and quickly reversed direction. The chart above shows TSS which is a swing trade that I took. 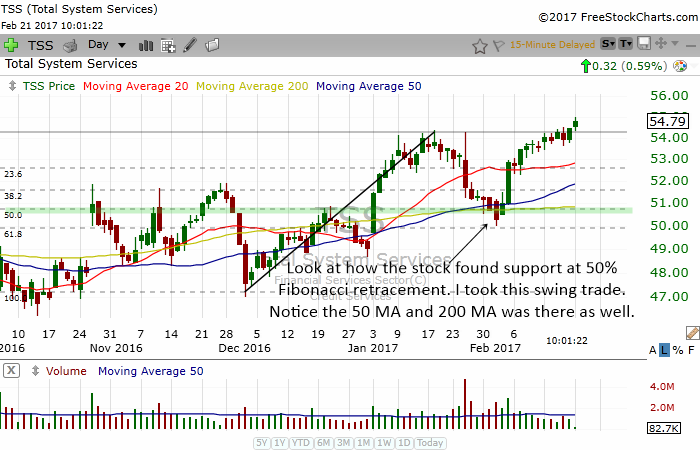 I did not look at the Fibonacci Retracement when I found the stock. I found it when I saw the 50 MA and 200 MA. Turns out that the area was also a 50% retracement. When you have many technical concepts emerging at one place, the odds of success increases dramatically. Round numbers can act as a psychological support and resistance. This is very true for an index. You will often see stock market indexes unable to go above round numbers. At other times, certain round numbers seem to magically keep the stock index from falling. 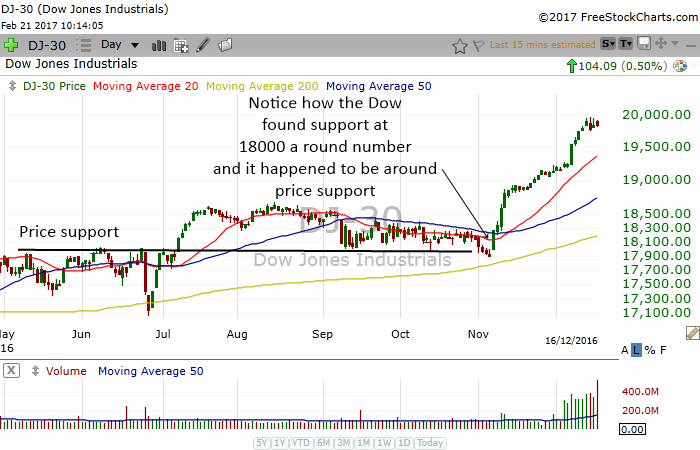 The chart above shows the Dow Jones Industrial Average experiencing a correction from September to November. Somehow the 18000 mark prevented the index from dropping. Couple with the fact that price support was around 18000 this gave us confidence that the market has a strong support at 18000. If you look back a few months to May, June and July, you will notice that the Dow had trouble going above 18000. 18000 acted as a psychological resistance point for the market. Of course it eventually broke above it. Round numbers work for stocks as well. 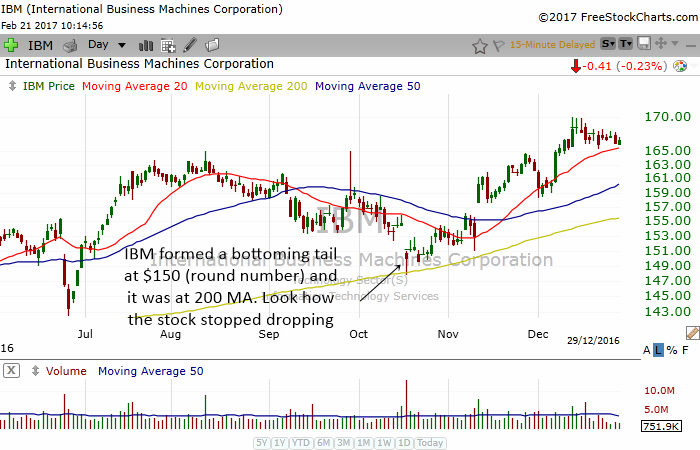 Notice how in October IBM found support at the round number of $150 which also coincided with the 200 MA support. 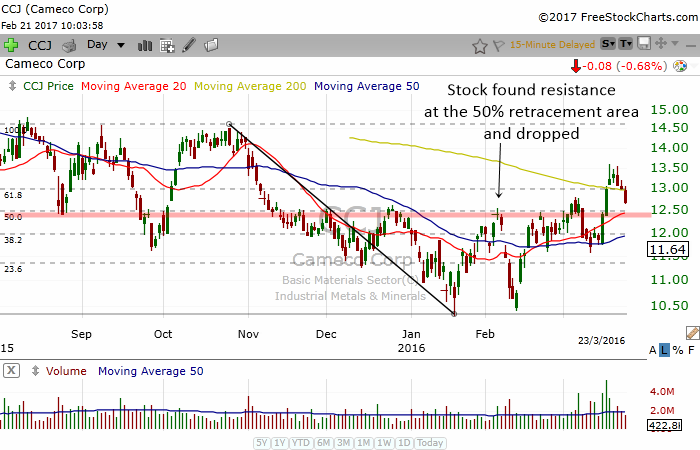 The stock found support there and rose higher.